American amplifier legend James Bongiorno holds US patent 4229706 for the bias circuit of a Circlotron transistor output stage. It was implemented in his Sumo 9. On his comeback project site Ampzilla2000, the narrative belabors the fact that no new amplifier architecture has been invented since JB's Great American Sound days: "Since his departure in 1982, there has been no conceptual topological discoveries whatsoever. None! Hard to believe but true. This is not to say that there aren't any fine amplifiers being made, as there are quite a few. However, virtually every one of them uses the same tried (or tired) and true circuits created by James way back when, with a lot of variations on a theme..."
Upon closer inspection, Bongiorno and his copy writer might grant an exception to the Thorens monos. Yes, they are transistor circlotrons just as certain Sumos were. However, the mid-power Sumo 9+ used 20 bipolar output devices, the high-power Thorens runs a single ultra-power Mosfet per phase of the cross-coupled floating output buffer that's at the heart of a Circlotron or parallel push/pull circuit. Uniquely, the Thorens then adds a 6-tube input/driver stage with complete DC coupling from input to output to avoid any and all coupling caps. And -- Bongiorno would appreciate this salient bit -- it gets away with a single variable current source to bias both half wave circuits. Just as Bongiorno's patent concerned itself with how to bias the floating counter phase circuits, so the secret of the Thorens lies in its three potted modules. They perform the precision servo biasing so critical to a high-power output stage that's not referenced to ground. The Circlotron itself goes back to 1955 and Henry Wiggins' Electro-Voice circuit, a dual single-ended floating bridge affair. Cecil Hall was awarded a US patent for it around the same time. Another accounting lists Tapio Köykkä instead as having held the very first two patents for Circlotron architectures, albeit limited to his native Finland. His schematic published in the German radio magazine Funktechnik (issue 7 of 1953) to predate the Electro-Voice product. 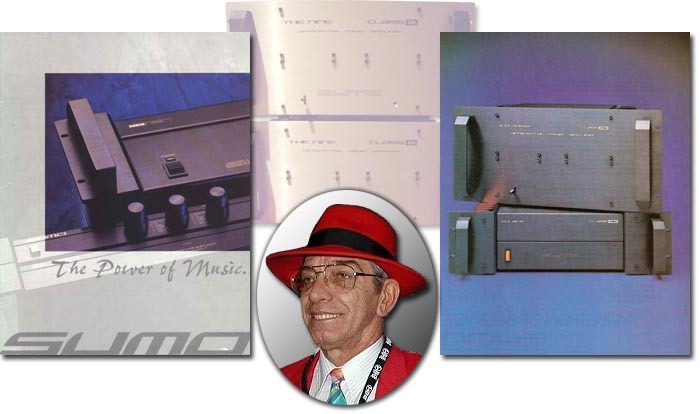 Then Jim Bongiorno used a Circlotron variation in his Great American Sound transistor amps during the 70s. The 80s saw Atma-Spere's OTL tube applications. BAT later joined that wagon with transformer-coupled circuits, Einstein with OTLs. And Gamut's high-power push/pull amps today use single Mosfets per phase to recall Thorens' "single-ended" massively monolithic 800W/300A monsters which eliminate the mismatches inherent in paralleled output devices. When you consider the specific implementation which accredited electrical engineer Frank Blöhbaum of Saxony has dreamt up for the new Thorens company under Heinz Rohrer, you'll see that despite sharing aspects with other commercial amplifier offerings past and present, the exact string of ingredients in the Thorens monos is unique. A jubilant 2006 review in the German Stereoplay replete with top-notch measurements and their team's ongoing use of the test monos as their in-house reference amps is naturally a main feather in their cap. While the reborn Thorens is a Swiss company in Giebenach and the trademark and logo the property of Thorens Holding AG, Basel, the built-in-Germany aspect -- Thorens turntables and new electronics are manufactured in Malmsheim/Schwaben -- only added patriotic pride. Thus said review ended in a gushing "the Germans are world champions again", an obvious reference to the Teutonic obsession with soccer [original Stereoplay review graphics next]. Such a patent-pending circuit contribution which still mandates closer inspection also begs a few other questions. The Thorens company's core competency and reputation we know and remember has always been with and for turntables. 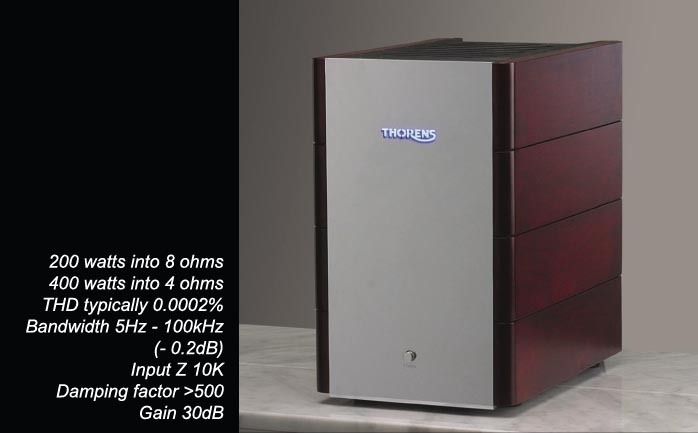 Not even the most presentient of industry pundits could have predicted the likes of the TEM 3200 under the Thorens banner. Who then is Frank Blöhbaum; how did he arrive at Thorens; and where is new owner and CEO Heinz Rohrer steering this company with the famous name going back to 1883 since acquiring and restructuring it after its 2002 bankruptcy? Any arm chair sleuth worth his slippers would smell an interesting story awaiting the telling. Cynics will insist that nothing new in amplifiers could possibly come from a small turntable firm; that any claims to the contrary will be marketing hype and bootstrap maneuvers in a challenging economy. By talking to both Heinz Rohrer and Frank Blöhbaum, a rather different picture emerged. To view Thorens' 1883 - 2008 time line, click here.